While many eagerly await for the birth of a baby giraffe, thousands of children in Africa are literally dying of thirst each and every day. The lack of clean, accessible water is one of the most pressing issues in Maasailand, Kenya – Africa. The Community Water Project works to bring safe and adequate water supplies to communities who currently live 10-15 kilometers from the nearest water source. The Partnership Project has established a long-term collaboration with local Rotary clubs, and Rotary International, as the Rotary community shares with us a commitment to clean water projects. This collaboration was initiated in 2004 by Prescott College students, led by Ann Radeloff and Kaitlin Noss, and members of the Prescott Sun-up Rotary Club, especially Tony Terrasi, and many Rotarians have given countless hours since toward developing this relationship. Four Prescott area clubs, District, and Rotary International, raised $74,000 to install a well in Erusiai, in the Narok area of Maasailand, a project overseen on the ground by Maasai Rotarian Daniel Ole Kaputa. Through the Erusiai project, we have discovered how much impact clean water can have on the ability of Maasai children to receive an education. The Erusiai Primary School was founded by Meitamei and three other Maasai people in 1990. At that time, the community had no school at all for its 160 children. The closest primary school was 10 miles away, and charged prohibitive fees. No funding was available from the Kenyan government for the construction of the school, so Meitamei and the others raised the equivalent of 50 cents from each family to buy nails and tin roofing. Using wood from their forest, they built a one-room schoolhouse with a dirt floor. Both Maasai men and women were leaders in this effort. Over the next 15 years, the community continued to raise money to hire additional teachers and supplies and to build additional classrooms. But their best efforts were not producing quality education—teachers appointed by the government were unenthusiastic about their assignments and hard to motivate, children developed asthma from the dusty floors, and no lunch program could be organized because the school had no water. Daily attendance averaged 45% of children enrolled. Year after year the school failed to produce even one student who could pass the Kenyan Primary Certificate (KPC) of Education exam that allows students to enroll in a secondary school. The Erusiai community was well aware of the broader range of issues that prevented the school from thriving. The community identified needs for: 1) clean water, 2) cement floors in classrooms, 3) teachers who believed that Maasai students could be educated, and 4) a school lunch program. To support this vision, the MCPP introduced the community to Prescott, Arizona area Rotary clubs, which funded a $74,000 borehole, generator, pump and distribution system, bringing clean water to the school for the first time. That well was completed in late Fall, 2007. The floors were cemented. New teachers’ houses were built with sanitation facilities and vegetable gardens, in efforts to recruit better teachers, and a Maasai women, Miss Kanana, accepted the position of head teacher. The school, under Miss Kanana, maintains high standards for both the students and the teachers. In 2008 Erusiai Primary was designated the Most Improved Primary School in Narok District, out of roughly 500 schools. Daily attendance is over 95% and enrollment is at 392 children. This high enrollment includes large numbers of children enrolled from other communities, who walk many kilometers each day to reach the school, and equal numbers who have moved in with Erusiai relatives to attend the school. More than half of the children being educated at Erusiai are girls, as the community considers the education of all of their children to be a priority. The community’s greatest achievement is that the school produced 30 candidates for the 20008 KPC exam, with 25 passing, 10 of whom students were girls. The MCPP supports the education of girls, in part, by supporting the economic opportunity of the entire community, especially through clean water projects. As women are freed from spending their days walking many kilometers for water, they can spend that time making beads and other products for sale, to raise tuition for their daughters. Maasai families have difficult choices regarding whether to educate their daughters and sons, as education can mean either increased or diminished opportunity. There are few jobs for Maasai high school graduates in Maasailand, despite the presence of a lucrative tourism industry, as Maasai people face employment descrimination. When children attend school they miss the education they would receive at home; boys do not learn to herd, and miss warrior training, and girls do not marry in their teens and undergo training in women’s culture. Many times, educated Maasai youth must leave the community to find work in towns, and they lose not just their place in the economy but also the spiritual life of the community. So education is a risk. But, as a community’s economy improves through access to clean water, as cattle are healthier, men enabled to stay closer to home to care for them, and people are healthier and better able to work, and daughters can be freed from carrying water and other necessities, the future looks less desperate, and parents are more willing to take this risk. UPDATE: The Erusiai water project has been expanded, through World Vision, which has completed constructing 15 water kiosks and troughs and miles of piping to bring water to a total of 20,000 people and four more schools. Expanding School Support: The success of Erusiai has led to requests from other communities to partner in building infrastructure for their schools. As in Erusiai, we find no shortage of vision and effort in communities across Maasailand, who have been trying to improve the educational opportunities of their children for many years and need only committed partners to succeed. 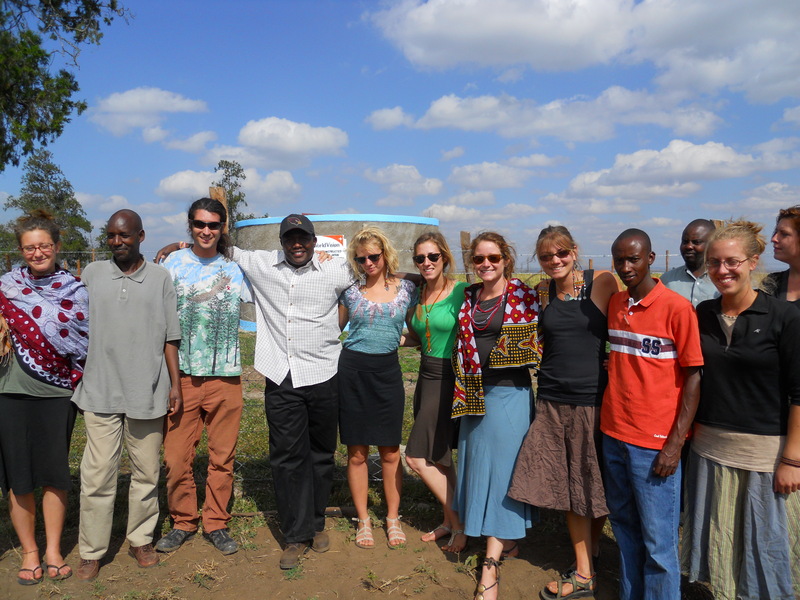 A second Rotary water project, a collaboration led by the Sedona club, was completed in December, 2010. That project extends the reach of an exisitng well in Mosiro to four additional sites and it is now serving four schools and a clinic and an estimated 30,000 people. Rotarians in Ashville North Carolina have worked tirelessly for five years to initiate a third project in an equally dry area of Maasailand: Keekonyokie. Unfortunately, after funds were secured and the project given the green light by the Rotary Foundation, the Keekonyokie area was hit by floods and the project site destroyed. This project continues to be of vital importance and we will resume this work when we are able. We are now working to complete the 4th water project in Maasailand in the Ndoinyo Olopi Community. This water project will serve more than 4,500 people through 3 distribution points and where there is water, life can flourish. Consider joining with us to make a difference in the lives of many. Here is a special video on the commissioning of the first project and the same ceremony will be held when we complete the last $20,000 or so of fundraising towards our $125,000 goal. Thank you for your interest in making the world a better place.